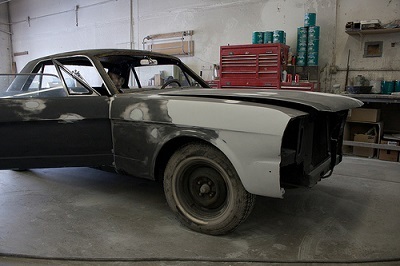 When it comes to preparing the bare metal surface of your car for paint, choosing etch primer or epoxy primer can be a paint-point that delays your progress. Google it, and you’re sure to be overwhelmed by divided opinions, citing technical information, personal experiences and subjective opinion… But the truth of the matter is, both types of primer will deliver quality results when used correctly. The primer you chose should be dependent on the condition of the metal you’re preparing for painting, the time you can allocate to the overall process, and your budget… and naturally an element of personal preference. Etch Primer Etch primer uses a mixture of phosphoric acid and zinc chemicals to micro-etch the metal surface it is applied to, which promotes adhesion for the coming layers, and also provides a layer of corrosion resistance to the metal. Self-etching primer cures quickly, but you will need to apply any body filler directly to the metal surface before applying the primer (making sure you DO NOT APPLY ETCH PRIMER OVER FILLER REPAIRS) As such, you need to apply the primer immediately preceding the strip-back to bare metal and bodywork, before rust begins to form on the metal surface due to oxidization. Unless you’re working with a small surface, this can cause complications for DIYers who don’t necessarily have enough time to complete the job in one sitting. So, an example of application process when using etch primer could be: 1) Perform bodywork and apply any body filler 2) Apply paint prep solvent to clean 3) Apply etch primer making sure not to coat any of the body filled areas! 4) Apply high-build primer on top 5) Paint basecoat or topcoat 6) Paint clearcoat if applicable Epoxy Primer Epoxy primer works slightly differently, gaining adhesion to the metal surface by sticking to it like glue, rather than etching on to the surface. This fully protects the surface from the elements, meaning you can work at your own pace without worrying about rust forming. You can also apply body filler directly on top of sanded epoxy primer, giving you the option of re-visiting your bodywork as you go by simply applying body filler on top, and then re-spraying epoxy to the area. This makes epoxy primer a more logical choice for jobs that require major bodywork that you might need to revisit more than once. The downside of relying on epoxy adhesion is you have to manually create the bite needed for epoxy primer to successfully attach to the metal, which can be done by sanding the entire surface of the body with a hard grit 80 to 180 sand paper. Epoxy primer also takes longer to finally cure. So, an example of application process when using epoxy primer to bare metal could be: 1) Heavily sand with orbital sander using 80g sandpaper and apply paint prep solvent to clean 2) Apply epoxy primer 3) Perform bodywork including body filler 4) Apply epoxy primer again over repaired surfaces (repeat if needed) 5) Apply high-build primer on top (sanding down epoxy with 180g prior) 6) Paint basecoat or topcoat 7) Paint clearcoat if applicable Still not sure which primer to go with…? For further information, enquiries or advice about the decision to use etch or epoxy primer when preparing to paint your car, contact the professionals at Bodyshop Paint Supplies today!